One of the things I enjoy about following election news is the phenomenon whereby a reporter appears to discover something about the election process and seeks to share it with her readers. While the information may not be new to a grizzled old electiongeek like me, I always appreciate the enthusiasm with which the resulting piece regards an otherwise familiar part of elections. When you’re out at the polls today, don’t just think about the candidates running for office, also keep in mind the the dedicated poll workers. After hours of training and — for many — more than 10 years of experience, poll workers flood into area voting sites at 5 a.m. to gear up for a 14-hour workday. While it pays well, anywhere from $95 to $175 for the day, the job involves a huge amount of responsibility as well as a deep knowledge of the election process and Indiana election laws. [Allen County Republican Party chairman Steve] Shine said the job of poll work is integral to the election process as a way to establish checks and balances. “It’s very important. They are the greeter, the concierge, the steward of the process,” Shine said. “They lead people to the right place. They make sure it’s secure and every ballot counts. Even if there is an issue, they know how a provisional ballot is cast. While the parties are obligated to assign workers to the polls, Court said workers are enthusiastic and passionate about the duty. “Poll workers are very excited to work on Election Day,” he said. “I was talking to the gentleman that fills our poll workers this year, and he said he talked to a lady in her late 70s and she about jumped through the phone when he called and asked her if she’s willing to work again. It’s that kind of excitement and energy. “It’s a great way to give to the community — they are getting paid as well — but it’s a nice way to give back to the party and the democratic process,” Court said. Mike O’Neil, a poll worker that attended inspector training Saturday at the Rousseau Centre, 1 E. Main St., in downtown Fort Wayne, said he initially signed up to work the polls to meet his neighbors. But now, after three years, he feels it’s his civic duty. Beth Dlug, director of elections at the Allen County Election Board, said it’s not uncommon for poll workers to return year after year. Ross Moyer is one of those dedicated poll workers. He has been at the polls for nearly 50 years. In his time, a lot has changed when it comes to how to vote. But one thing that’s unchanged is his civic duty to participate. I can’t say I learned anything new from this piece – but I still wanted to share it because I think it demonstrates how the election process (and the people who run it) are still capable of generating excitement and pride. Poll workers do so much in our voting system; thanks to the News-Sentinel for sharing their experience and dedication with their readers … and now the rest of us. 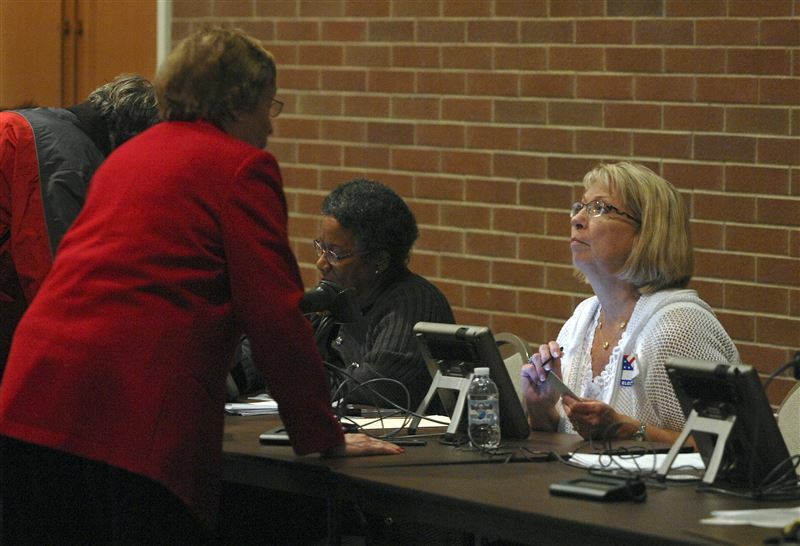 Be the first to comment on "WE NEED YOU AT THAT TABLE: Indiana Piece Explains, Extolls Role of Poll Workers"